The benefits of solar power were pretty clear for a California school district; so much so that residents had the foresight to approve a bond issue to pay for a solar power system that will pay for itself in very short order—and go on to generate savings that benefits their kids. The structural contractor on the Clovis projects, M Bar C Construction, has built its reputation on carport construction. It has developed a pre-approved set of adjustable structural plans with its partner, 4 S.T.E.L. Engineering, which has been accepted by the California Department of State Architecture. Renewable energy projects are sometimes all about the numbers. The Clovis Unified School District in central California did the math—and calculated that it could save a lot of money on electricity costs with the installation of solar power generation projects on school property. That's because, in part, it would continue to supply power to the grid even when the schools sit empty in summer, at a time when the school district's energy demand is drastically reduced. 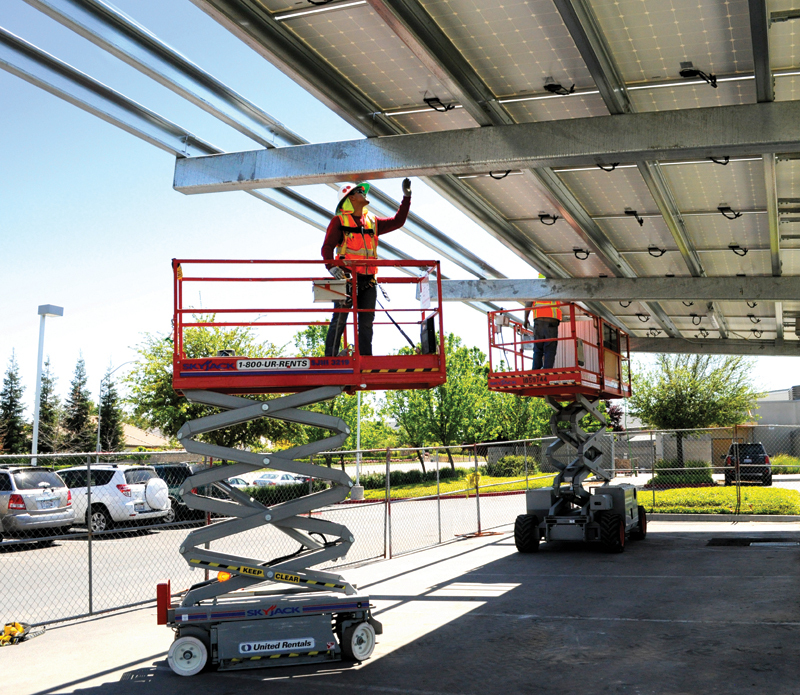 Given the potential savings, Clovis school district voters agreed to spend $25 million to install a total of 21 solar power systems on parking lot canopies and playground shade structures to generate 5.87 megawatts of electricity. The district expects the project will shave $2.7 million from its total $7.5 million annual energy bill, which it will be able to redirect to the classroom. The savings comes through a net metering system where the power generated by the solar installations is directed to local utility Pacific Gas and Electric (PG&E). The school system then receives a credit back on its energy consumption. It also receives rebates from the state for this installation under the California Solar Initiative. Clovis project is the largest it has managed so far. "The district gets credit on its electricity bill based on what the [power] tariff might be at the particular point in time that it is exporting electricity," explains Rick Brown, president of TerraVerde Renewable Partners. "With schools, that's particularly beneficial because they reduce their operations and their load usage in the summer. That's the time when power costs are the highest. So they are getting really high credits for a six to eight week period in the summer to offset their annual bill." This opportunity to offset power costs also provides school districts with additional benefits related to the sizing of their solar installations. The Clovis School District installations were handled in four phases, and construction began in 2012. Commissioning of the final project is expected in January 2014. "It allows the school district in the original bid spec and project development to size the project significantly less than what their actual usage might be," says Brown. "In the case of the Clovis project, it's producing about 83 percent of their annual electricity consumption but will offset 100 percent of their bill. One of the things that we bring to the table is to make sure that the system is not overbuilt or underbuilt." He adds that matching the solar power system to the load is the critical variable in maximizing savings to the school district. TerraVerde Renewable Partners did the initial legwork for the Clovis School District through a feasibility study to determine if there were opportunities for energy savings by installing solar production, as well as identifying the school sites where installations produced the greatest savings per dollar invested. There were 90 power meters at school facilities in the Clovis system that were eligible, and 21 meter tie-ins were chosen. The company then helped the school district through the construction process, including development of bid specifications and solar array layouts prior to development of a request for proposals (RFP) and project construction. The Clovis installations were handled in four phases, and construction began in 2012. Commissioning of the final project is expected in January 2014. General contractor on the overall project was Cupertino Electric Inc.
Don Hartman, project manager for Cupertino Electric on the Clovis project, says the company has extensive knowledge related to solar power installation and has been active in that sector for over eight years, with 800 MWs under contract for construction. Among the biggest challenges on the Clovis project—the largest and most complex school-based project constructed by the company—were the sheer number of sites and that the schools were active sites with teachers and students on campus during a majority of the construction. "We had to get the work done and, at the same time, make sure that the schools stayed operational and safe for children, parents, and all the activities," he says. "There was no one-size-fits-all approach either. Each site was unique in how it operated." For example, there were sites where at certain times of the day contractors could not operate large machinery, equipment, or accept deliveries. Hartman described tie-in coordination with PG&E as "extremely challenging" given the aggressive timeframe for completing the projects. The projects involved scheduling someone from PG&E to help with the tie-ins, while trying to minimize school disruption because of power shutdowns to accommodate the tie-in work. Hartman credits Cupertino Electric's experience in dealing with these types of disruptions, with power transfer to solar occurring as smoothly as possible and on schedule. Subcontractors and suppliers to the Clovis project were required to meet the specifications of a Tier 1 manufacturer. The solar panel supplier was Canadian Solar while the inverter supplier was Solectria Renewables. The racking design used in the installations was provided by 4 S.T.E.L. Engineering. M Bar C built the parking and shade structures and installed the racking system. The DC combiner boxes were provided by Bentek Systems while the AC disconnect was provided by Siemens and Square D. The data reporting and weather station supplier was Deck Monitoring. A one string level combiner box, for education pur-poses, was supplied by the Shoals Technologies Group. The structural contractor on the Clovis projects, M Bar C Construction, has built its reputation on carport construction for 38 years. It has developed a pre-approved set of adjustable structural plans with its partner, 4 S.T.E.L. Engineering, related to the foundation, columns, beams, and purlins, which attach the solar panels to the roof. The plans have been accepted by the California Department of State Architecture and take such issues as wind load and the earthquake-prone geography into consideration. Drew Lippert, M Bar C vice-president of operations, says having these pre-approved plans eliminates months from the permitting process. About 80 percent of the structures were shade structures in parking lots; but there were unique challenges like the school bus parking lot and shade structure, which houses about 100 buses, requiring the ceiling to be 19 feet high. The district office and bus shade structure, which generates 840 kilowatts (kW) was the largest site while the smallest site was a 144 kW site at a high school. A higher percentage of the construction was handled during the summer months to minimize school disruption. A detailed calendar was developed regarding which construction activities could take place on a site-by-site basis—no parking lot was shut down for construction more than 50 percent at any time. This was accomplished through staging of construction activities. 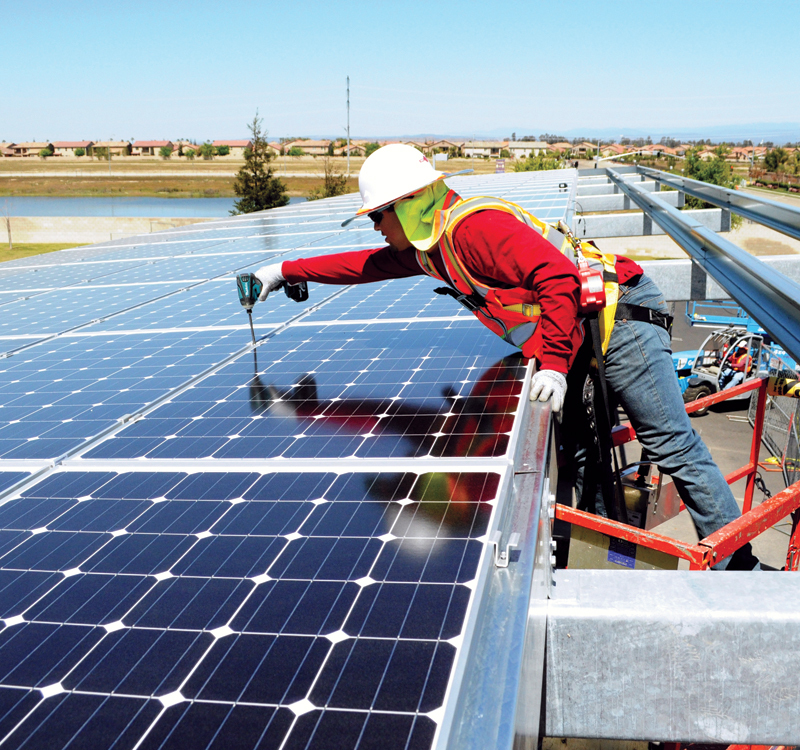 TerraVerde will manage the solar power system for Clovis Unified School District after completion of the project until such time as the school district feels comfortable managing it on its own. Cupertino Electric's Don Hartman says the Clovis project was highly successful because of the excellent communication and coordination between the school district and the project's subcontractors. The school district worked with California-based TerraVerde Renewable Partners as an energy advisor. TerraVerde Renewable Partners has extensive experience working with school systems and municipalities in the state on these types of multi-site projects. "The project would not have been as successful without the school district's help and the work they put into it," he says. To raise the money to pay for the project, the school district issued a general allocation bond that voters had an opportunity to vote on in June 2012. They approved the bond issue, which triggered the bidding process on the solar installations and resulted in the final engineering, procurement, and construction (EPC) contract, with implementation overseen by TerraVerde. According to California law, the project was also overseen by an independent engineer who reports to the Department of State Architecture. Rick Brown of TerraVerde Renewable Partners says that the Clovis school district has taken the correct approach regarding energy management because for the past five years and prior to constructing the solar installations, it has reviewed and implemented energy savings programs as a cost-saving measure. These were programs like removing microwave ovens and coffee makers from individual classrooms. The school district also installed various controls and monitoring systems for such high energy demand services as air conditioning. "They got to the point where they felt like they had squeezed as much juice out of that turnip as they could and realized that if they were going to save even more on their energy bills, they had to look at solar—but it was only after they had affected the demand side. That's generally the right way of doing this," says Brown. He says that since a large number of multi-site solar projects have been constructed in California, there aren't a lot of mysteries related to the selection of panels, inverters, and tie-in equipment, from a technical standpoint. The challenge going forward is primarily in the application of this technology in the school districts and municipal areas. "Because it is such a unique and different way of doing business for schools and municipalities, it's the education part that is the most complex—helping clients understand the information associated with the risks and benefits of these kinds of investments and providing good information to support their decision-making," says Brown. It involves both the staff who will monitor and operate these systems as well as people on the governing bodies. "The voters in the Clovis school district decided to tax themselves to do this because they had the foresight to say that if we tax ourselves to pay for this project, it is going to pay for itself in very short order, and it's going to generate 35 to 40 year savings that benefits our kids," says Brown. "For them to go ahead and do that is a measure of their commitment to their kids' education."